facilitated by two CCNet coaches and supported by two practitioners who know the Open Standards very well. Photo by Estuardo Secaira. Conduct a “classic” conservation plan that defined marine conservation targets (such as important fisheries, sharks and rays, whales and dolphins, marine turtles, and marine birds) and focused on marine-based threats and spatial strategies and solutions that we converted into zonation and regulations. Seven of the eight conservation targets we identified were defined as a zone, each with its own regulations. Conduct a sectorial analysis in order to better understand the dynamics and challenges faced by the more relevant economic and/or biodiversity activities that occur in the Pacific Ocean of Guatemala, such as commercial and sport fishing, whale watching, and marine traffic. Analysis and discussion of all four activities resulted in the definition of zones and regulations, with commercial fishing being the most important and influential for spatial planning. 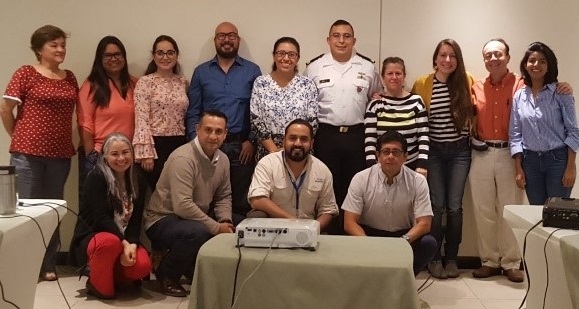 Throughout the planning process, the Guatemala Fishing Authority (DIPESCA by its Spanish acronym) was fully empowered and enthusiastic about implementing the proposed zonation and regulations. 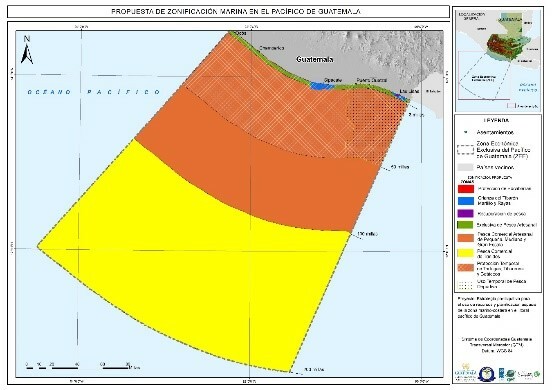 Marine zonation of the Pacific Ocean of Guatemala. Image shared by Estuardo Secaira.